It’s a well-known fact that, for the most part, writing doesn’t pay. Or at least it doesn’t pay until you make it big, though you might be surprised by how few authors ever reach the heady heights of JK Rowling’s wealth, despite being on the best seller lists for weeks on end. So what do aspiring writers do to make ends meet? Some sacrifice luxury and get a part time job in a cafe, devoting the rest of their time to writing in the hope they’ll have that much needed break and be catapulted out of their Hackney bedsit into a Hollywood condo. Others, like myself, who have fallen into a relatively comfortable way of living and aren’t keen to suffer for their art to quite the extent of living below the poverty line, get a full time job. Days, therefore, are spent in an office, doing someone else’s bidding for eight hours or more at a time, and nights are spent trying to fit writing in amongst the other many competing priorities. But I’m not complaining, and nor should anyone who is serious about making it as a writer, because if writing is your passion it shouldn’t be difficult to make time for it. What can be a problem for the aspiring writer, however, is what they choose to sacrifice to make time for their writing. In my case, I’ve realised that what’s all too often being sacrificed is reading. I take my Kindle to work every day, but on the journey there often struggle not to be distracted by the free newspapers. I therefore spend the duration engrossed in the latest drama in Rihanna’s love life instead of making a start on the latest Booker Prize-nominated tome I’ve downloaded. Before conceiving my 365 day writing challenge I would at least spend the return journey reading a good book, but in recent weeks even those few precious snatched minutes have been compromised, as I’ve spent them drafting that day’s blog post. What this means is that although I am now (at long last) writing regularly, when it comes to reading I’m not getting much further than the odd sensationalist tabloid press story – hardly inspirational stuff. What’s troubling me is this: How can I even hope to be a good writer if I’m not seeing how it’s done by learning from the best? To use an analogy, imagine trying to ride a bike without seeing someone else do it first. It’s not that you couldn’t do it – if you had instructions you’d get there in the end – but the whole experience would be harder, and you might not end up cycling to the best of your ability. The realisation that I’m not reading enough has made me see I need to reassess my priorities again; rather than substituting reading for writing I must make time for both, or risk my writing being so badly compromised that the heady heights of JK Rowling will always remain out of reach. 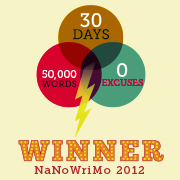 This little badge represents me having completed my fourth National Novel Writing Month. It serves as a reminder of how important writing is to me – perhaps in light of today’s post I need a similar talisman for reading?